New fast transmission slipping fix from Mega Power. Pour-in drive fix stops transmission leaks, rough shift, slipping. Avoids repair need. Introducing a new transmission slipping fix from Mega Power. Normally, when your transmission starts slipping, it requires lots of new transmission parts and a $2500 plus repair bill to get on the road again. Some have bought part-store additives that mostly turn out to be quite harmful, rather than helpful. We like this well-respected Pour-in-n-drive product from Mega Power for our slipping fix. Its success comes from geting to the several causes of slippage - and 9 out of ten times the product ends the slip, shift problem. Order this product before it quits completely. It will help you avoid a costly repair. Or at the least, put off the repair need for a year or so. If you like that idea. Those conditions are varnish, shrinkage of O rings, friction, and a dirty shifting control valve. Mega Power works by being thinner that oil giving Mega Power ability go to the dirty trouble-causing spot. There to free, clean smooth, and add a co-polymer fill to worn spaces - and revitalize shrunken O rings -ending the slip. If left along, your cars negative wear factors deter the closing tightness of your transmission clutches and shift bands - and you feel its effect as shift slippage. This Mega Power Transmission Treatment ends those problems. A Customers transmission slipping fix, report. Order Mega Power now and get on down the road of life happy again an with a good shifting transmission. One Mega Power Transmission Slip Treatment includes 3 items shown. Includes Easy to follow Do-it-yourself directions, phone help if needed, guarantee. Delivered by FedEx or USPS in about 3 days to your door. Just $65 plus $15s&h= $80 total. 2 Mega Power Transmission Slip Treatments For 2 cars or trucks. Includes 6 items. $115 plus $15s&h= $130. Save $30. Since slipping occurs when varnish, shrinkage of O rings, friction, and or a dirty shifting control valve makes for a sloppy, instead of tight hold on the clutches - you want all those negatives cared for in an additive - and that's what Mega Power covers for you! How Mega Power removes those wear and tear negatives and allows full pressure again to be applied to the clutches - ending slippage, and rough shifting. Mega Power does so by using special cleaners that remove varnish and sludge in the valve body and shift parts. And by modifying friction and by conditioning of worn surfaces - to tighten them up. Like Lucas, STP, Restore, CD2, and such, thicken the oil to build pressure and act as a transmission slipping fix. The trouble is they may increase the heat load by having no way to smooth friction rough surfaces, and do nothing for leaky seals, and dirty shift valves that can also cause slippage. Today's transmission requires more than fortified oil. They need special cleaners, acid neutralizers, friction modifiers, and ingredients to coat worn spaces. Each contribute to stopping slippage - like reducing friction drag, and heat, to end transmission slipping. Those advantages are included in Mega Power and the reason for its high success rate. Of course, if your slippage has gone on for some months, it is a toss up on what's left on the clutches, if it will work. Order Mega Power below - it may be what you need, for sure! I'm sure your transmission will be helped by Mega Power. Mega Power success rate is about 8 out of ten. Mega Power is a 3 item treatment with easy to follow directions. The 3 items include anti-slip cleaners, and anti-slip conditioners to smooth, heal, coat and anti-slip condition to stop, or keep slippage from getting worst - until an overhaul can be done, if the problem does not end. A pre cleaner is added to the old fluid, car driven for 5 to 10 minutes, then dirty fluid replaced with new. The 2 conditioners are added with the new fluid. Cleaning and Driving does the fix. Mega Power is a transmission service treatment for any good running transmission - to keep then clean and problem free, years longer. Order one for your good car to keep it protected, too. One Mega Power Transmission Slip Treatment includes 3 items shown, Do-it-yourself directions, phone help if needed, guarantee. Delivered by FedEx or USPS in about 3 days. 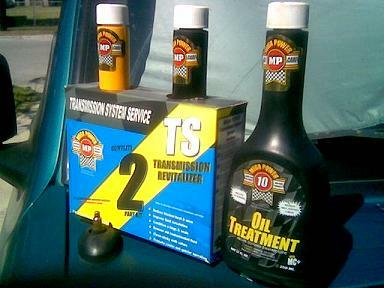 Those sold in parts stores and quick lubes use solvents - like Trans X, to flush or stop a transmission or engine problem. transmission product in your engine or transmission - unless you want to instantly destroy the oil or fluid's ability to lubricate, and increase friction. Stay away from solvent additives. They are harmful. Mega Power works by using new chemical cleaners to clean the shift valves, and to remove varnish that now hold the clutches loosely slipping - avoiding the expense of taking the transmission apart to do so. Mega Power Metal Conditioners MC+, heals wear roughen gears, shafts, and pistons that hinder tight clutch positioning - ending that cause of slippage. Mega Power Fluid Modifiers are a group of anti-wear coatings that fill worn spaces, condition seals and gives the many O-rings, gaskets and seals a controlled expansion - stopping existing leaks and preventing new leaks. The same Mega Power advantages for your motor works similarly and will make your motor run good as near-new again, too. Order a treatment for your transmission and motor, too, for years more of like-near-new dependability! Details and discounts listed below. Shown below. The Mega Power Transmission Slipping Fix Treatment. It is what your car, truck, and equipment needs. This product is also the best product to use when its time to service any automatic transmission - or power steering system. Mega Power product cost is under $100 - not $1500 to $4000 like a repair would cost. The product - a treatment, is easy to install yourself. Driving caused your problem. Driving and Mega Power fixes it now! A simple two step method is required. The ingredients go where oil or ATF fluid cannot go. There, the product opens clogged passage ways, frees sticking shift control valves, cleans, expands and revitalizes o-rings seals and gaskets - friction modifies, and adds a protective coating, ending all causes of slippage. Mega Power amazingly smooths friction roughen gears, shafts, and bearings. And its protective layer fill worn spaces - to quickly stop transmission slipping, and for smooth positive shifts again. Internal and external slippage stops in about a day. To order Mega Power to end your problem, and avoid a costly repair, call and say, you want to order the Mega Power TSR3 Treatment. $60 plus $15 s&h= $75 total. Shipped to your door with instructions by Fedex in 3 - 4 days. Treatment for two cars: $135 total. Save $15. Shipped to your door with instructions by Fedex in 3 - 4 days. 6 Treatment for 6 vehicles: $300 total. Auto repair and fleet. Includes shipping. Shipped to your door with instructions by Fedex in 3 - 4 days. $65 plus $15s&h= $80 total. Order Mega Power for your motor & your transmission; save $25. 9 items: both for $115 plus $15s&h= $130. Save $25. Mega Power Transmission Service Product link.